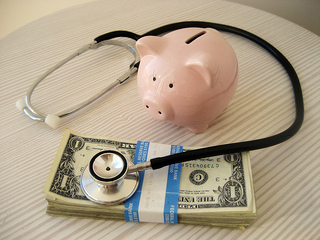 Emergence of the 401(k) health plan? The idea that health insurance might follow the trajectory of retirement finance, with employer-covered insurance moving toward a defined contribution, 401(k)-style approach, rather than the current, defined benefit, Pension-like approach is one I have written about before. In today’s news (WSJ) is an article describing how a handful of employers are transforming the way they offer healthcare for their employees. Instead of the employer selecting the insurance plans, and offering them to the employee, these employers are apparently giving their employees a fixed sum of money and letting them select their own choice of insurance plan (from a predefined set of choices). In other words, these employers are moving from a defined benefit approach to a defined contribution approach, just as pensions moved a few decades ago from defined benefits (pensions) to defined contributions (401(k)’s).